This is a rectangle Alfred Peats Wall Paper porcelain sign. This particular Alfred Peats Wall Paper sign is predominantly white with a navy shamrock in the center. 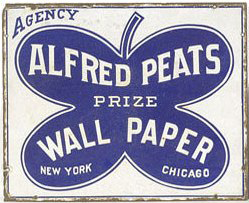 It reads, “Agency Alfred Peats Prize Wall Paper, New York, Chicago”.